England duo Karen Bardsley and Jill Scott have signed new two-year contracts with Manchester City Women. Their previous contracts were due to expire at the end of this season but the extensions will see them stay at City until at least 2017. Goalkeeper Bardsley, 30, told BBC Sport it was an easy decision to make to commit her future to the club. "I'm honoured and it's a privilege that they've decided they'd like to keep me on," she said. "They're really changing perceptions of women's football and raising the bar across the board, and this is the starting point. "You're only going to get better being at this club. If you come here and you don't improve then there's no excuse." 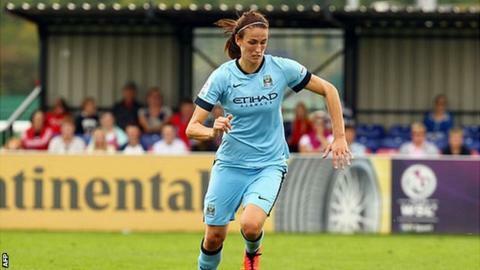 Midfielder Scott, 28, says she now wants to finish her career at City. "I would love to. I don't feel like this club is just short term, I feel like it's long term," she said. "Women's football is definitely going to grow and there's going to be a lot more girls coming through. "Eventually, when I stop playing, this is a club where I would like to help develop the young players as well." England captain Steph Houghton also signed a two-year contract extension in May. And Bardsley expects the current squad to stay together for the foreseeable future. "We're all not ready to move on yet," she said. "We're in a great place right now in terms of our careers so I think we're all looking to stay for a very long time. "We're all learning as we go so it's never the finished product. We're just laying down the foundations for generations to come." Manchester City Women are currently fourth in Women's Super League One, three points behind leaders Chelsea with a game in hand.